Good news! 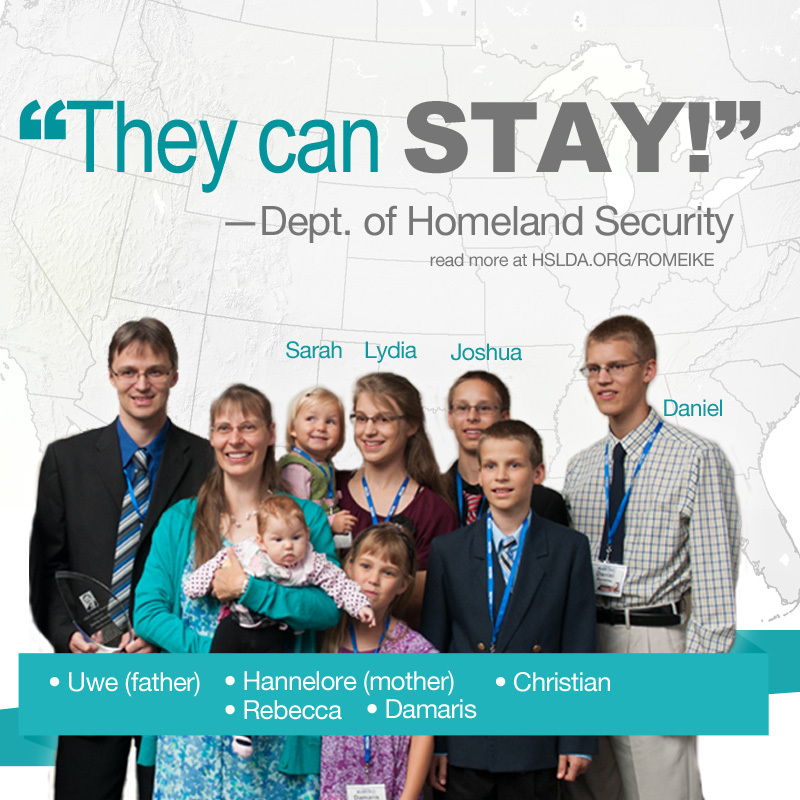 The Department of Homeland Security verbally informed the Home School Legal Defense Association that the Romeike family is being granted indefinite deferred action status. In other words, this means that the order of removal would not be acted on and that the Romeikes can stay. We are incredibly thrilled here at HSLDA! On March 3rd, the Supreme Court issued a denial of the Romeike family’s petition for certiorari, sparking an immediate and unprecedented reaction. Fox News told HSLDA that they recorded over 1 million page views of the Romeikes’ story in 24 hours—an all-time high. Although there were many who were not surprised by the Supreme Court’s decision, it seemed that this might be the last hope for the family to avoid being sent back to Germany where they would undoubtedly be persecuted for homeschooling their children. Uwe Romeike said he is extremely grateful for the support and welcome he has received from America. We are happy to have indefinite status even though we won’t be able to get American citizenship any time soon. As long as we can live at peace here, we are happy. We have always been ready to go wherever the Lord would lead us—and I know my citizenship isn’t really on earth. This has always been about our children. I wouldn’t have minded staying in Germany if the mistreatment targeted only me—but our whole family was targeted when German authorities would not tolerate our decision to teach our children—that is what brought us here,” he said. HSLDA Director of International Affairs Mike Donnelly made the point that the only reason the Romeikes had to come to America was because of Germany’s repressive policy towards homeschoolers. Farris expressed that there was no way he would have let the family go back to Germany.